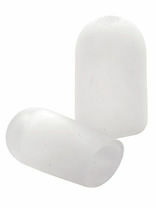 Traditional shape for relieving pressure and friction on toes and fingers. Can be trimmed. Superior cushioning, protection and relief for corns, calluses, nails and cuticles, hammer toes and partially amputated digits. One Size. 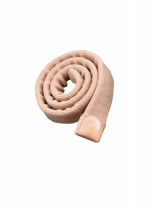 Use – shoe aid specifically designed to fit around the material between the toe of the flip flop. 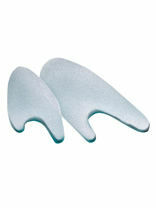 Helps reduce friction and irritation between toes with very soft, comfortable polyurethane gel. 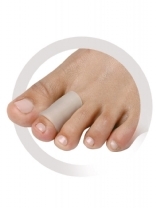 With integral toe separator to help realign toes and prevent inter-digital toe abrasion and discomfort while providing protection and comfort. 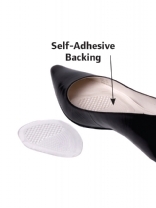 Adds medial arch support for fallen, weak, or high arches and pronation problems. Our polyurethane material is dermatologist tested, hypoallergenic, latex free, and can be applied directly on the skin. Priced per pair. One size. Use – the aperture off-loads pressure from 1st metatarsal head. Ideal for turf toe, sesmoiditis, hallus limitus, and hallus valgus. Prices per pair. One size. Provides cushioning around painful calluses. 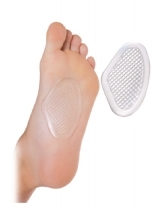 Reduces pain by transferring pressure from the callus to the pad. 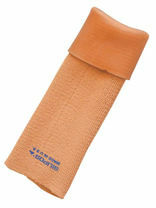 Ideal for calluses, blisters, metatarsal pain, fat pad atrophy, and metatarsalgia. Priced per pair. One size. Ultra Thin - One Size. Priced per pair. Cushions and protects ball of foot area. Helps prevent the burning sensation in ball of foot. Self-Adhesive: Stays firmly in place. Washable and Reusable. • Use - Reduces friction and irritation and provides relief on the bunion joint • Toe loop is flexible and fits around the toe to ensure spreader stays firmly in position. 4 per pack. Ultra Thin - One Size. Priced per pair. Cushions the balls of the foot to help prevent aches and pains. Designed with a shock absorbing pattern which holds the product in place. One Size. High-grade mineral oil releases comfortably on contact with skin to soften corns. Extra protection and comfort for smaller fifth toe. May help relieve pain from tight shoes or other pressure. Washable and reusable. 6 per pack. Provides protection and comfort for nail problems, dry or cracked cuticles, corns, hammer toes, kerotic lesions and partially amputated digits. 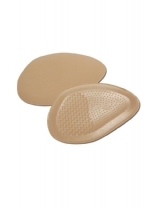 Use - traditional shape for relieving pressure and friction on toes or fingers. Medical Grade Silicone absorbs shock, vibration and provides even pressure distribution and anatomically designed for comfort and support. Sold as a pair. 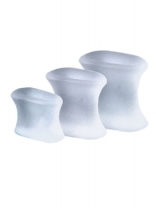 Tubing, pads and caps are ideal for the protection of toes and fingers. All Silipos and Podopro gels contain a medical grade mineral oil will help to soften and moisturise the skin. There is a product for almost all digital conditions that would benefit from the cushioning effect of the gel.